Most political candidates spend time poring over fonts and colors in order to find the perfect road sign. James Clark, the Democratic candidate for District 12 of North Carolina’s State Senate, chose to go for confusion, shock value and hard-to-read print on his signs instead. Clark, who ran unsuccessfully in the Democratic primary against Brad Salmon for the same seat in 2012, has several different signs peppered throughout Harnett County this year — some with President Barack Obama and Martin Luther King Jr., and others with “Clark vs. Langley” written on it (that’s right … he’s including his opponent’s name on some signs). Clark faces Joe Langley in the Democratic primary this spring for the chance to contest Republican Ron Rabin in the fall. Clark received nearly 5,500 votes in the 2012 primary, losing out to Salmon’s 8,300-plus. Wow , After asking several people that have been following the primaries for information on James ? Not much was known at all , I heard , he is not very responsive to the people . He has been invited to many Lee Democrat events and did not show ? I searched for a long time online about this fellow and found very little information at all. Joe Langley on the other hand is out in the public , visiting local events and really talking and listening too! We do not need Rabin in office and I think Joe will be a very good replacement ! Just wondering, is James Clark ashamed of the party he’s affiliated with, or of himself? Is that why he will not post a picture of himself? 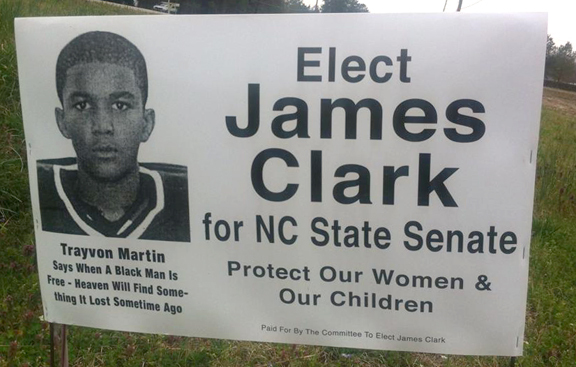 Is he using Trayvon Martin’s picture as a 12 year old, a sign as to what he will be as a Senator, Not being honest with the public, only showing things that are not true. Is this the type of person he wants people to believe him to be? Well what is it Mr. Clark? He was at the Democratic Primary forum tonight. He was late but he was there. It was always an adventure when it was his turn to respond to a question. He never really addressed any of the questions but I learned a couple of things. “Teach a child to smile and they will learn how not to cry”. “Four plus four equals ten as long as five plus five equals eight.” “Don’t pay those people in congress.” That is about all I could distill from his presentation. Now that is just weird , dawg . I asked folks in Harnett Co for info they said good luck cause they aint getting much either ? I swear I think he is a plant from the repubs ..? I can only speculate as to what motivates him, but I can say that he doesn’t have a base of support. Any votes he gets will be accidental. Of course you can figure to get at least 30% of the vote in a two person race just by being on the ballot.